We take pride in having the best bar staff in the Denver, Boulder, and front range area. 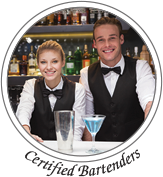 All of our bartenders are TIPS certified and bring more life to your party. By providing key insight when developing a liquor selection, our excellent mixologists will work with you to create beverage stations that reflect the theme of your event. 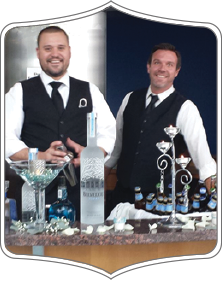 Not only are we licensed and insured to work at any venue in Colorado, but our custom bartending services come equipped with everything you might need to throw a great party. From bars and tables to glassware and garnishes, The Modern Edge Events can provide everything you need to put you at ease for your big event! It's your party, so why pay for drinks you didn't serve? By letting you supply the alcohol, we give you the freedom of choice and ability to deliver a unique experience your guests will surely remember. If there is a particular cocktail that you desire, just let us know so we can bring the extra mixers & garnish that will take your drinks to the next level. 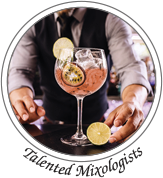 Our mobile mixologists will be there to execute your vision and provide liquor, wine, and drink recommendations so you can pair each beverage with your menu and budget. 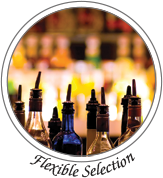 We can even help you find liquor suppliers who offer bulk discounts and event pricing. Bespoke Cocktail CreationsBespoke Cocktails Let our talented bartenders create a custom experience and deliver beverages tailored to your event. We take care of the details so you don't have to. 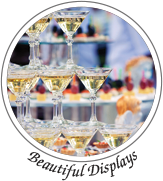 From setting up stunning beverage stations to crafting unique cocktails that are sure to impress, we help make your events spectacular! Because we've provided service to weddings, corporate events, social gatherings, parties, and more... You can be sure our certified staff can help make any occasion a success.